This is a guest post by Rohan. If you also want to write guest post at TricksRoad, Please check this. There are numerous ways to improvise your blog. Improvising doesn't guarantee you more income, but rather more readers. The more value you provide to your readers the more would be the outcome. Everyone loves to upgrade. And I guess everyone likes to discover and explore new things and take businesses on to the next stage. 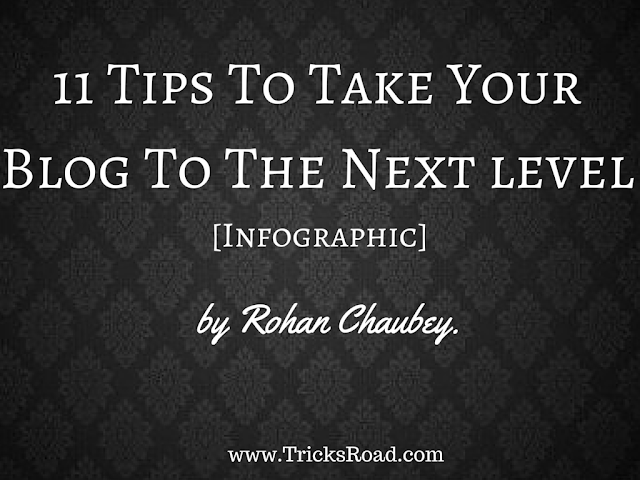 I am going to share with you 11 amazing tips to take your blog to the next level in the below Infographic. For better view, click on the image and zoom it. Please include attribution to http://www.tricksroad.com/ with this graphic. The following are the guidelines to take your blog to the next level. By saying this, I am not asking you to keep on dumping content on your blog. I urge you to write compelling content that stir up discussion, conversation and engagement. Writing blog posts just to make your blog look fully filled would not do any good to you. Periodically, produce content and keep up the consistency. Cooking up controversy can do wonders. In fact, it can actually take your blog to the next level by bringing in more traffic and quality readers. Be biased towards the stories which benefit you. Be out-spoken and have your own voice. Do not always follow what others are saying. Form your own opinions and ideas. Thrill your audience by providing them information through various visual aids like Inforgraphics, Presentation and Videos. And some vloggers suggest that video blogging can be a huge deal to get more followers. Competitions and Giveaways bring a lot of new readers to your blog. Hosting blog carnivals weekly or monthly can prove to be great if done correctly. Ask readers to submit their posts and select a theme for your carnival. Or after selecting the theme invite others to link up their own posts. Ask other bloggers to join you to write articles which were never written before. This keeps your content fresh and avoids the redundancy. Currently, if we see, there are a few bloggers creating great content and others are just producing the same in their own way. So to bring freshness in your posts ask others to join in. Instead of charging for your templates include attribution in the footer which links to your main blog. Periodically release new designs and try to link back to your blog creatively. If you are good at designing graphics either make graphics and let people use it for free. Now you would think what’s your profit in this? The catch is, You can ask users to provide a credit link back to your blog. Create a dedicated App for your blog and launch it in the market. Make sure your App provides value to your readers. Otherwise, no one will waste their storage space. You can include features like live chat and social media feeds in the App. 9. Make a nation on the Internet! Create your own small kingdom on the internet. This can be done by building a community and starting a forum on your blog. Provide special advantages for the members of your community and encourage members to stay active. Participate in forums and communities to find out what people are talking about. Explore what people love in your niche. Target your content around that ‘wow’ factor and this will surely increase engagement. Let me explain this by giving you an example. I write a blog where I share my knowledge on topics falling under categories such as tech or personal development. Talking about Tricksroad.com, this blog creates content that always revolves around ways to make your blog successful. So my message to you is that follow your main theme and decide your content strategy according to it. These were some best tips using which you can definitely take your blog to the new height. I am sure you must be using some awesome techniques to achieve the success, what strategies do you use to attract more readers? Do you have some other tips or ideas to take your blog to the next level? If yes, do share it with me. 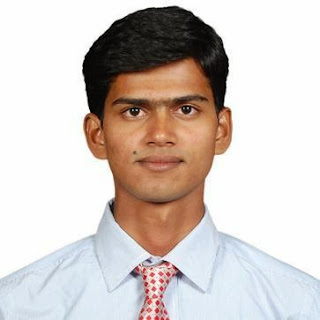 Rohan is a Student pursuing computer Engineering. He is an enthusiast blogger, presentation designer and loves writing quotes. He runs a blog which can help you understand new technologies, programming languages, social media and personal development. He writes and considers it his mission to spread light of knowledge and optimism. 25 comments to ''11 Tips to Take Your Blog to the Next Level"
First of all a big bravo to you on creating and publishing a wonderful infographics post that shows your high level of professionalism. The thing that impressed me more is the selection of your topic. It is easy to create an infographic on how-to types of common posts. But this one is the conceptual topic that does not demand two plus two types of suggestions and one needs to mention the qualitative points as you mentioned. Your infographics is very simple and simplest to understand which means you fully succeeded to convey your message to your readers and this is the ultimate aim of every internet marketer. First of all welcome to TricksRoad !! And i agree to you that, Rohan has worked superb in creating this amazing Infographics. Hats of to him and I am glad that you liked it. Thanks for sharing your thoughts. Have a good day. I am glad to see you on TricksRoad.com. Thank you so very much for the appreciation. Your encouraging words means a lot for us. Thank you for taking time to read and for providing us the feedback about the post. Firstly, thank you for inviting me to be an guest author on Tricks Road. It was wonderful writing a post for this blog which I closely follow. Thank you so much for appreciating my work and I feel honored to read such lovely comments. I hope we continue to work in collaboration in future as well. First of all I would like to say thanks for this awesome post with this infographic. 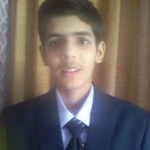 Rohan I strongly like your point that we should focus on our main theme of our blog. Its really very important to keep visitor regular on your blog. Also all other point very clear and important. We are glad that you liked the post. Yes, we need to highlight the main theme of our blogs everywhere possible. That not only gives our readers a clear idea about our blog but also encourages their future participation if the niche is followed by them. Thank you Naveen for taking time to read and leave a supporting comment. ~ Rohan. Wonderful post indeed - who doesn't want to rise to higher levels, and this is a great resource to do that. I'd say improvements and changes are a must, and this exercise will only do good and benefit you in the times to come. You got it all right - it's all about YOU and giving value. More content is good, but only as far as they are qualitative. Well, controversies attract people, but you need to be careful and not always use this road of popularity. I agree that infographics and videos are great to view, but not every blogger can create them. But visuals are so helpful to the readers. Giveaways are great, but I guess it may not be easy for bloggers in different niches to find sponsors. I think building a blog community is the way to go in 2015. Though maintaining forums is not an easy task that I learned the hard way, but the efforts are certainly fruitful. You both are a part of the ABC, so you'd know what all it takes to maintain one! I guess you create a nation and citizens without boundaries, like we've Ahaians over at the ABC! Yes, the blog content has to be 'wow' as well as helpful, meaningful, and useful. Having a content strategy is essential and I'd say do everything on your blog that helps the readers in whatever ways. I agree with you, it's not easy to manage forum and taking it to a new height everyday but one thing i can say is, you're doing it amazingly. Aha!Now is one of most successful forum in the blogosphere. Yes, improvising is a continuous process. Ma'am, there are great tools to create site templates and design in minutes. If someone has ample of time, then they can surely invest in this venture. Now, we no longer need programmers to design sites for us. A normal Web designer can do that job well. Thanks a lot for taking time to read and to post such a lovely reply. Have a relaxing Sunday. Double Kudos to you for the Awesome article been Present before us. .
Quite some time now, I've been Following your Updates and Articles even at your Blog ( rohanchaubey.blogspot.com ) which they have added some Tips to my life as a Blogger. . i Gladly appreciates your Efforts. Presently, am hustling to activate The #4 hint being mentioned above to my blog. . i Pray It'll put few smile on my face. Thanks again man, I'm out for now until i come your way again " So Cheer! " Thanks for joining in and no doubt Rohan is superb !! Happy to read your comment. Just visited your blog and I liked the post in which you compared WordPress and Blogger. I have even left a reply/comment on it. Oh My God! This is so amazing to know that you follow my blogs and you even landed on my guest post. So nice of you, John. Glad to hear that you are going to follow the Tip #4. If you host a blog carnival some day do invite me. Thank you so very much for dropping this encouraging comment. Have an awesome day! Not until you tell me bro. . The guy is enrich with vital info . Sure Bro. Always you will find quality article on TricksRoad. Let me join Mi Muba to say bravo. This is a wonderful post and the topic discussed is of great importance. Every one wants to take his blog to the next level so this post solves the problem. I love the infograph as it is simple and very informative. It is filled with practical tips that can help any blogger take his blog to the next level. I love the points raised most especially collaboration and being controversial. Thanks for sharing this awesome post. Have a wonderful weekend. Thank you. I am glad that you liked the infographic. I too love to collaborate and write up posts. In fact, I am starting a new series on my blog where weekly or monthly bloggers will discuss about an issue relating to blogging niche. Thank you so much for taking time to read and to a comment. Have a great weekend you too. I surely think it is important to take our blog to the next level. That definitely does not have to be about money all of the time, it could easily mean building a better and more thriving community of loyal readers. Quality and engaging content is king in my opinion. Adding value so that the reader can take something away from what they read is vital. I am not good at creating infogrphics and videos yet, but I am working in 2015 to make that a part of my marketing arsenal for sure. I do see the importance though, because I know that people are visual and that causes more engagement as well. Collaborating and supporting other bloggers will build some awesome relationships,which is necessary for success online. I learned quite early the importance of building relationships and am so thankful for the wonderful relationships I continue to build each and every day. We must remember that we cannot do it alone. I like your wow factor comment. That is very important to capture the attention of your reader with such value and engagement that they are looking forward to your next post. We must always think about providing value, value, value! Make it about them and not ourselves. I'm really thankful for what you shared on this post. It's definitely aimed too see bloggers achieve in taking their blog to the next level. That's something I would like to accomplish. Your info-graphics have always been impressive and to the point. I do have a question. How do I go about creating one and also where can I go to find images that I can add my own text and quotes to? I find that extraordinary people have the power to change and empower a whole community. Thanks for being extraordinary. I will definitely answer your questions in a Private message. Thank you so much for taking time to read. You are an #Inspiration. Hey Ashutosh, I would be trying few of your tips. i have book marked this post for easy reference. A helpful blog post. Glad to Know Ajay bro that you found it helpful and Thanks for bookmarking. I am glad to read that you found it to be helpful. I am sure you new blog will get even more exposure if you use some of the tips mentioned here. Thanks for visiting and leaving a nice comment. Enjoy your Sunday! Nice tips on growing your blog. They simple and doable. Also number of them have you thinking out of the box, which is always good when you're trying to grow. I try to point out different perspective on known topic. It kind of gets people, cause you're used to one thing but it get you with another.